Hello everyone! 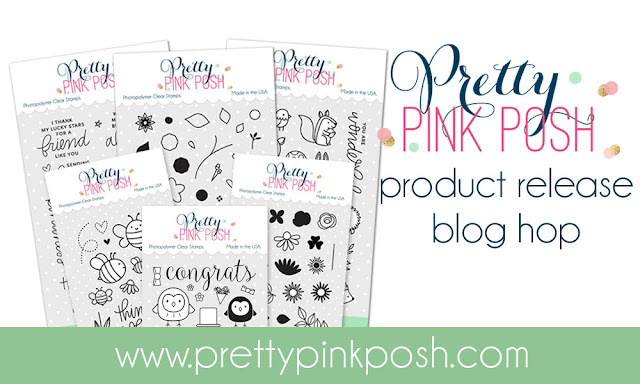 Welcome to Day 1 of the Pretty Pink Posh Product Release Blog Hop. I have two projects to share with you today using these oh-so-adorable new stamps and dies. Shall we? ¡Hola a todos! Bienvenidos al primer día del "Blog hop" de lanzamiento de la nueva colección de Pretty Pink Posh. Hoy tengo dos proyectos para enseñaros con los nuevos sellos y troqueles. ¿Vamos con ello? My first project features the "Woodland Friends" and "Bee friends" stamp sets and their matching dies. I simply stamped everything with Memento Black ink and colored it with Copic Markers and pencils. Then I arranged all the images to create a scene and add some interest by cutting a small rectangular window on the card. En mi primer proyecto he usado los sets de sellos "Woodland Friends" y "Bee friends" con sus troqueles correspondientes. Simplemente he estampado todo con tinta Memento y lo he coloreado con rotuladores Copic. Después he colocado las imágenes creando una escena y le he dado más interés abriendo una ventana rectangular en la tarjeta. My second project is a Transparent Shaker Tag made with the new Scallop Circle Tag Dies. First I used Oxide Distress Inks on a piece of cardstock and die cut two Scallop Tags out of it. Then I cut a circle in the middle, added acetate on both sides and foam tape to make a "sandwich". The shaker is filled with a mix of sequins: Iridescent Star Confetti, Iridescent Mini Star Confetti and Silver Star Sequins. The sentiment belongs to the samp set Everyday Greetings and I stamped it on acetate using Stazon Opaque White. Mi segundo proyecto es una etiqueta "shaker" transparente que he hecho con los nuevos troqueles "Scallop Circle Tag Dies". Primero he usado tintas Distress Oxide en un trozo de cartulina y he troquelado dos etiquetas. Después he cortado dos círculos en el medio, he puesto plástico trasnparente en las dos y cuadrados de espuma en el medio para hacer un sándwich. La etiqueta está llena de una mezcla de lentejuelas: "Iridescent Star Confetti", "Iridescent Mini Star Confetti" y "Silver Star Sequins". El sentimiento pertenece al set de sellos "Everyday Greetings" y lo he estampado usando tinta Stazon Opaque White. That's all from me today, but before you go just wanted to tell you that there are 4 $25 gift certificates up for grabs, two winners will be chosen each day from the comments section of every stop of the hop, so don't forget to leave a comment before 11:59PM PST on 5.17.2017!!! Winners will be announced on the Pretty Pink Posh blog. Y eso es todo por mi parte, pero antes de que os vayáis quería comentarios que se sortean 4 tarjetas regalo de 25$. Se elegirán dos ganadores cada día de la sección de comentarios de las participantes en el "blog hop", así que no olvidéis dejar un comentario antes de las 11:59PM PST del 17/5/2017!!! Los ganadores se anunciarán en el blog de Pretty Pink Posh. Thank you so much for stopping by, next stop is the wonderful MELODY RUPPLE!!! Muchas gracias por la visita, la próxima parada es la maravillosa MELODY RUPPLE!!! Amanda Korotkova < You are here! I love the scene you created behind the bunny. The coloring is wonderful. I like how you added more dimension by doing the cut out window. Both cards are lovely but my fave is the first one! I just love the bunny card, with the rectangle window. You always share such great ideas. Thanks for the inspiration. This is such an adorable scene! Love it! Your card is adorable. Love the design. And what an awesome shaker tag. The flowers and bunny are sweet looking. I ,Ike the soft look of your card. My fav is the first card. I love how the flowers and mushrooms are lined up. Pretty! Very cute but my favorite is the Shaker card. These are both awesome Amanda.The bunny card is adorable and I am a huge tag fanatic and this tag is just amazing. Very well done! I love, love, love this sweet bunny card! So adorable. And I love shakers - so fun. What an adorable first card and a very pretty shaker card!! Darling card and a sweet shaker tag! Love that adorable bunny! Oh wow, love them both! Both completely different, but so sweet! Very cute card...love the flora peeking out this window. Darling scene in your rectangular window, Amanda! That bunny looks so proud surrounded by the floral garden. And, your shaker tag is lovely also! super pretty card and tag! Wow! That bunny just makes me smile! Adorable card and shaker tag! So sweet! Thanks for the inspiration! Sweet card and love the shaker tag. Great Card I love how you layered the flowers and mushrooms behind the bunny! I never seem to think of things like that. And the little shaker card is sweet. Thank you for sharing. I really love the bunny, mushrooms & flowers in the acetate window, so adorable. Love the bunny among his flowers. I really like the starkness of the card and then WOW that pop of color! love your mainly white theme on your first card- so pretty and adore the colors on the second project! Your little scene in the cut out window is so adorable! Love your card .... these little critters are adorable! Great little scene behind the bunny! The shaker tag is amazing! WOW! I just love how you layered all the little images to create a magical background for the bunny and bee images. Such a cheerful and fun card. I just love the way you also coloured in all the images, very nice. That bunny is so cute. And genius user of the tag die! Awww.... how cute, and pretty! I love both of your projects. Your card...wow. That's a bunch of die cutting and it looks awesome! Love the clear element of your shaker card, so fun! Your shaker tag is really, really pretty. THIS card is fantastic! SO pretty! I love the little bunny and those gorgeous flowers! Amazing! Awesome projects. Those mushrooms caught my eye! And that tag! I have got to step outside of my comfort zone and try a shaker tag! Adorable! Beautiful card and tag! Love those mushrooms! Love that sweet bunny tucked in those cute flowers and mushrooms. Just lovely. Love your created bunny scene. Very cute! Such cute and fun projects! Me encanta todas las tarjetas!!!!! They are beautiful! Your two creations are awesome. I specially love the bunny in a flower bed, really lovely. Love the card. It is my favorite in today's hop. And the tag is so bright and beautiful. The bunny card is so cute. I need to get the idea of bunnies only for easter.. I love this card and fun greenery. The shaker card is awesome. The bunny card is adorable! I love how you layered the mushrooms and flowers in the window. Love this sweet card and that adorable bunny from Woodlawn Critters!! And that sweet Thank you tag is perfection too!! Love the layout on your first card! I need to try that because it adds so much interest! Cute little shaker too! So many great ideas....so little time! TFS! I like the style of first card! Very elegant. The first card is really super sweet....I love it! Both of your cards are very creative! I love how clean and colorful the "you are wonderful" card is. Loving the new releases!!!! I LOVE the scene and the cut out and I can't get enough of shakers! Beautiful cards. your card and scallop circle tag are so cute. I love the bunny with all the mushrooms! Love your cards and the bunny. This card is so adorable I just want to go and hug this bunny! My neighbor's daughter had an angora rabbit when she was little and I babysat for her. It had really long hair and it was big! Yours is cuter and there is no hair to brush because it would get matted. I love this card! I love how these sets coordinate so beautifully! I still need the floral set. Love your little bunny card! Such a sweet bunny card and tag!! You have made such a gorgeous card using all those new stamps! They are super adorable! I really like both projects. I'm loving the transparent shaker tag! I've got to try that out! Love this layout. Pinned it! Awww!!! How cute!!! Both your cards are absolutely adorable!!! Absolutely love your cards. Love how sequins just add that extra touch. Amazing projects!! That bunny card is the sweetest thing ever!! Love it!! Great projects; love your adorable bunny card. Your use of white space with the brightly colored central scene is awesome! TFS!! The bee and bunny are so cute. Fabulous shaker card - ingenious design. Beautiful cards! That bunny is adorable.